Will Perfect Privacy do the perfect job? Read on to find out. Various media reports have revealed that some of the founding members of Perfect Privacy and also its running members involved themselves in some legal proceedings that took place in Austria and Germany. These reports also say that back in 2012, these founding and running members propagated far-right political views, participated with related groups and spread Neo-Nazi agendas. What we have also come to know that some of the founding members of Perfect Privacy actually received jail sentences for their actions as a result of those legal proceedings. What various media reports have not cleared up is how involved with the company these members were. People also want to know what did they do at the company? And what role did they have, if any, at the company when they received their prison sentences. Moreover, we also don’t know much about the political affiliations and/or current status of the political views that the leadership behind Perfect Privacy may or may not hold. When reporters questioned a Perfect Privacy representative, Robert M, he told reporters that Perfect Privacy never had a rightist background. Moreover, he also informed reporters that Perfect Privacy had a clear neutral position on issues related to politics. On the face of it, Perfect Privacy is a VPN service provider that heavily focuses on privacy. That is probably the reason why the people behind the company went for such a name. Perfect Privacy comes with a reasonable set of standard features. It offers above-average VPN server speeds. But it doesn’t go easy on its pricing its packages. When Perfect Privacy came onto the VPN scene, it had expensive VPN subscription packages. Recently though, Perfect Privacy has changed its pricing. Now they are much closer to the industry average. All Perfect Privacy packages have more or less the same features. The packages themselves only differ in terms of the duration of the VPN service. Hence, Perfect Privacy gives away the biggest discount to those users who sign up with them for the longest period. If you sign up for Perfect Privacy for a period of 24 months, you’ll gain the maximum discount. Our calculations show that you can use Perfect Privacy for around €8.95 per month if you sign up for 24 months. Upon conversion, that comes to about $9.75 per month. If you don’t want to commit to Perfect Privacy for that long a period, there are other options as well. You can sign up for a shorter duration. But that will cost you more. For example, if you sign up for the one month package you’ll have to pay around $14.70 per month. That is €13.49 per month. This is basically the Perfect Privacy monthly plan. Perfect Privacy does not have a free trial. Perfect Privacy has no money-back guarantee period either. New users will just have to take the plunge and sign up for one of its packages. This is where Perfect Privacy tries to match some of its competitors in the VPN industry. You can’t pay via credit card even if you want to. Because Perfect Privacy wants you to use an intermediary online service such as WebMoney and/or PayPal. This ensures that Perfect Privacy does not collect too much information on a given customer. Hence it only opts for information it absolutely needs. Moreover, the options of paying with Bitcoin further shows that the company is serious about privacy. A company that is dedicated to privacy. According to official documents, Perfect Privacy is a result of an initiative of independent and private industries that belong to different parts of the world. The company also says that it dedicates itself to ensuring user anonymity and privacy online. Perfect Privacy has its base of operations in New Zealand. It also has offices in Latvia. Each Perfect Privacy user gets to connect an unlimited number of simultaneous connection for each account. Moreover, Perfect Privacy also gives users the option to cascade around four VPN connections simultaneously. Cascading is another term for chaining up. You can chain multiple VPN connections with Perfect Privacy. This is a cool feature, no doubt. It basically allows users to pile up several layers of security and anonymity. Of course, you should expect a massive decrease in connection speed when you use this feature. For what it’s worth, Perfect Privacy has an explicit policy on what users can and can’t do on its VPN servers. In other words, the company allows torrenting on all non-US VPN servers. So if you are connected to a US VPN server, you can’t engage in torrenting. However, all other servers are fine with torrenting. We have already mentioned at the top that Perfect Privacy has kept itself busy in introducing new features to its service. Let’s talk a bit about that. Almost all of Perfect Privacy VPN servers now support IPv6. It means that users can take advantage of IPv6 connectivity. And that holds true even if your internet service provider does not support it. But hang on, there is more. Perfect Privacy has a host of other updates that will make their way very soon. The first of them is the beta version of its VPN manager for Apple’s OS X, Android, and Linux. The company says that it aims to bring other possible filters as well such as no-advertising along with other anti-phishing and malware-ridden domain features. Perfect Privacy says that it will automatically introduce these features on its VPN servers in the coming months. Perfect Privacy has VPN servers that are located in more than 25 countries. It has more than 40 VPN servers in those 25 countries. The spread of its VPN servers is reasonable as it covers Europe and some regions on other continents as well. So if you want to use a VPN service that has plenty of servers in Europe, then Perfect Privacy deserves your attention. But that doesn’t mean it doesn’t have any servers in other regions. Without security, there is no point signing up for a VPN service provider. Security is the one thing that VPN service providers cannot compromise on. A VPN service can have slow VPN server and still survive. It could have a rudimentary official website and still get some customers. But if a VPN service provider doesn’t have the standard level of security, then it is toast. No customer is going to want to sign up for a VPN service provider that can’t protect his/her data and privacy. Let’s take a look at how our VPN service provider performs in this category. Perfect Privacy offers its users with options to connect via IPSec or OpenVPN. If you go to the official Perfect Privacy website, you can find a deep breakdown of what these two options offer. We would suggest to our readers who are more interested in how these options work to go to the official Perfect Privacy and have a look around. The OpenVPN implementation uses AES-256 bit encryption. For the IPSec option, Perfect Privacy uses AES-256 bit encryption as well. Strangely enough, Perfect Privacy says that it uses this encryption most of the time. Perfect Privacy representatives would tell you that the IPSec encryption implementation depends on user’s operating system, device and performance capability. Perfect Privacy also offers SSH2 tunnels. But these are only available to users on an application-by-application basis. Perfect Privacy does keep logs. But only non-personalized ones related to server bandwidth usage. In other words, they don’t monitor or keep track of any of its user’s IP address. It doesn’t monitor their connections. And the company does not track their user’s server logins. There is a general saying that the first impression is the last impression. It couldn’t be truer when it comes to the VPN industry. A visitor will only become a customer if he/she is impressed with what he/she sees on the official website. A VPN service provider could have all the qualities in the world. But if the VPN service provider cannot convey that to the visitor in a convincing manner, then it won’t survive for long. Because visitors would not get a good feel of the VPN service provider that doesn’t have a reasonable official website. Official websites don’t have to be flashy. But they must be well organized. They must convey information clearly and succinctly. Top VPN service provider such as IPvanish and NordVPN have great official websites. They are slick, fast and to the point. And that is what you want from a VPN service provider. How do we rate Perfect Privacy’s official website? The Official website, though okay, is not as slick as what some of the other VPN service providers have put out. It isn’t that easy to navigate because of the theme it uses. But it manages to do a good job of providing useful information to visitors. This makes sure that the new user assimilates with the website and the company more easily than otherwise. We haven’t seen too many VPN service providers who like to put out technical information on their official websites. Perfect Privacy goes one step further and even advised users on which VPN protocols they can use. Visitors can access all of that information under the Info tab on the official website. There is also a server status page. This page lists out the utilization and current loads of all Perfect Privacy VPN servers. The official website also has a page that dedicates itself to helping visitors know more about visible (and in most cases) original IP address. You can also use the same page to check for any DNS leaks that your connection may have. Perfect Privacy also has a blog. The blog portion provides new updates on the service. Sometimes, it talks about recent security vulnerabilities as well. There are other details pages as well but those are dedicated to server locations and other stuff. Whether you have heard it a thousand times or not. Of course, it is not important as a VPN service’s security or speed, but it is important nevertheless. Without customer support, a user would have nowhere to turn to if he/she runs into a problem. And if a paying customer can’t find the solution to his/her problem quickly enough, he/she will leave for a competitor in a market that is filled with good VPN service providers. The days of offering an email service as a form of customer support are long gone. Now a VPN service provider not only has to provide excellent email support, but it also has to make sure it has customer support available at all times. That’s why some of the top VPN service providers in the industry offers features such as live chat 24/7. So where does Perfect Privacy’s customer support rank? Can it compete with the likes of IPVanish and NordVPN? There are a total of three ways in which Perfect Privacy offers customer support to its customers. There is also a remote desktop support option. None of the above-mentioned options are available 24/7. That is a huge downside. With that said, you can expect fast response times from the company’s customer support staff. Also, expect friendly responses to your questions. And you can always send them an email to set up TeamViewer support times. These usually work in the form of sessions that have fixed timings. What about the forum then? We can’t say it is good but it certainly acts as a nice addition. The official website is already replete with information about the VPN service but a forum adds that extra bit. With the forum, you can expect some peer support as well. And there are always those discussions which can unexpectedly supply you with an answer to your problems. The forums get regular attention from Perfect Privacy staff as well. Though don’t expect too much forum activity. Of course, it isn’t exactly a graveyard either. Most VPN service providers try to make their sign up process as quick and painless as possible. They want the customers to sign up for a package. So why not make the process quick before they change their mind? Following that, Perfect Privacy has a very easy signup process. You only need to give the company your email address if you want to subscribe to a package. The website informs users that they can use a throwaway email address if they would like to. Along with the email address, you’ll also have to provide the VPN service a username and a password. Apart from that, you do not need to give away any other piece of information. Once you have registered, you can go to the payment options page. This page will allow you to extend or begin a new subscription. The other thing you should know about the payment process page is that it relies on a third-party payment service provider. Hence, Perfect Privacy does not need any other piece of information from the user at this stage of the sign-up process. As mentioned before, Perfect Privacy offers several choices for users on how they access the company’s VPN service. Users have the option of using configuration files with Vanilla OpenVPN or Viscosity client if they want to. Of course, you will first have to own a copy of Viscosity before you can use it with Perfect Privacy. Perfect Privacy also has its own dedicated VPN Manager. It is basically a frontend for OpenVPN. The Perfect Privacy VPN Manager sets itself apart from others with purely its functionality. If there is something that you want your VPN client to do, Perfect Privacy’s VPN Manager can do it. The VPN Manager has all the standard functions that you would expect from a VPN client. Options to utilize TCP instead of UDP. This option is specifically useful for those that use public WiFi hotspots a lot. Public WiFi hotspots, as you know, block UDP most of the time. These settings are a lot in number. But Perfect Privacy VPN client has a slew of other settings as well. These settings basically protect the user from leaking traffic away from the VPN tunnel. There is one option there that protects by blocking all traffic that doesn’t go through the VPN tunnel. You can apply this setting when the VPN client connects to a server. You can also change the settings to block traffic only when the program is running. Or you can set it so that it protects by blocking all traffic at all times. There are other similar good options as well. There are some that protect against DNS leaks. And others where you can manually specify the DNS servers that you want to protect. As mentioned at the top as well, the most cool option that Perfect Privacy offers is the VPN cascading option. In other words, chain-together-multiple-connections option, if that makes sense. Basically, you can chain together several VPN connections. A bit like what you see in hacking movies that come out of Hollywood. So if spy agencies are tracking you, you can use Perfect Privacy to change countries and stack them up. Spy agencies would get to one country to only find out that there is another country behind the first country. They would never get close to your real location since you have used four different country locations behind your connection to the internet. The main application screen is somewhat pleasing. It displays a list of VPN server locations. There is a separate status for live VPN servers along with ping times, load times and total bandwidth. The VPN application also shows the user’s current location and IP address. So Are There Any Downsides To The Client? The VPN client has a lot of options and hence has an unfriendly user interface. In fact, let’s dial it down a bit. Let’s just say that it is not as intuitive as that of other premium VPN service providers such as IPvanish and NordVPN. This is not a cause for concern though. Because you can always choose the option of using vanilla OpenVPN client. You can also use Viscosity if that is available to you. Hence all you have to do is switch to those instead of the VPN Manager. A VPN service provider could have great feature. It could also have great privacy. And it could offer the most advanced security. But if it doesn’t do all of those things at speed that it isn’t any good. What use if a VPN service provider if you can’t even open Google via its VPN connection quickly. Modern VPN industry is tough. If a VPN service provider wants to survive this industry then it has to offer good quality in almost all departments. Yes, you could relax in offering the absolute best customer support to your customers, but you can’t do the same when it comes to speed. So where does Perfect Privacy’s speed stand among the top VPN service providers? Our research for this Perfect Privacy review shows that It offers excellent speeds. You should expect minimal drops in speed when connected over IPSec tunnels. The OpenVPN connection with AES-256 bit encryption will obviously decrease your internet connection speed a bit more. But expect to operate at 90% of your original internet connection speed. Expect to have great peer-to-peer speeds as well. You should have no problems in viewing media heavy websites and YouTube videos. You can even stream HD movies while you are connected to the VPN Manager. Connect to US and UK based servers to get the best speeds though. To measure the speeds for yourself, you can always make your way to websites like speedtest.net and speedof.me. We did not find any problems with IP and DNS leaks throughout the duration of our research for this review. That should not come as a surprise though. Because the VPN Manager has built-in protection for that. Perfect Privacy ensures safety via the company’s own DNS servers. This acts as another cap feature in the company’s cap. Anyone who is concerned about privacy has nothing to worry about with Perfect Privacy. There is no point in a VPN service provider giving you all the features in the world if it doesn’t have great compatibility. Modern VPN service providers have to make sure that they cover all the major platforms. And that includes mobile and desktop platforms. All the privacy and protection won’t do you much good if you can’t use it on all of your devices. Moreover, there are hardly any web users out there that operate solely on a single device. Hence, if a VPN service does not offer support for platforms such as Android, iOS, Windows, and Linux along with Mac OSX then it loses previous marks. Some of the top VPN service providers such as IPvanish and NordVPN make sure that they have great and native support for all major platforms. So what about Perfect Privacy’s compatibility prowess? But Mac users don’t need to feel sad. Because Mac users can alternatively make use of TunnelBlick client. Perfect Privacy also provides official configuration files for TunnelBlick client hence you wouldn’t have to spend too much time in setting up the thing. iOS users have to deal with a limitation. They can use Perfect Privacy config files only if they have the official OpenVPN Connect application. Perfect Privacy also has setup guides for PPTP and L2TP/IPSec. Though the company recommends to users to now use both of these since they both have security flaws. For Android users, they can also make use of config files for the official OpenVPN Connect app. 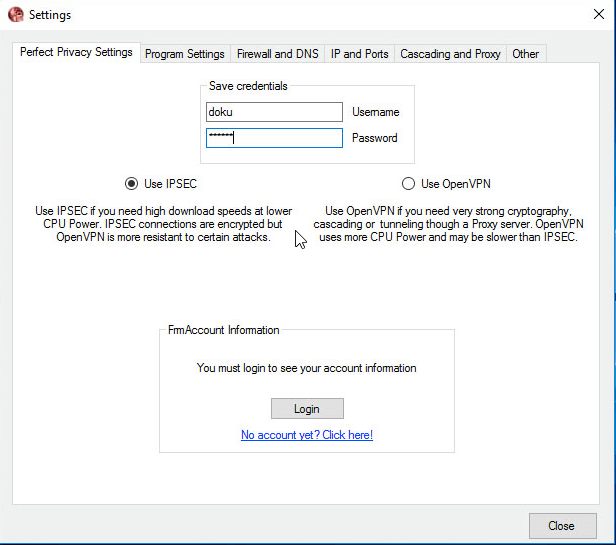 And as always, Perfect Privacy has installation and setup guides for both PPTP and IPSec on the official website. We have already told you that Perfect Privacy offers its VPN services in two flavors. One of them is OpenVPN. And the other one is with IPSec. You can use whichever you want to. But the company also offers other options. The Company also offers SSH2 tunnels. These are specific tunnels which users can use for applications that have to do with security issues. As mentioned before, this VPN service provider has its own Tunnel Manager. This Tunnel Manager handles all of the above-mentioned functions. It also gives links to Bitvise and PuTTY for users who want to use third-party solutions. 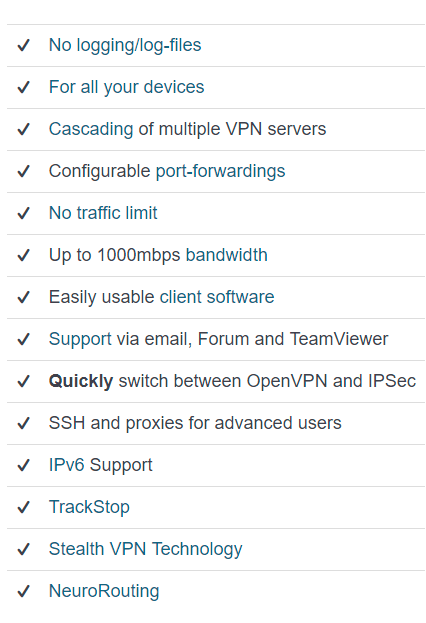 And just like the company’s IPSec and OpenVPN connections, the SSH2 service makes use of the industry-standard AES-256 bit encryption. Perfect Privacy’s official website also offers another product. This product comes in the form of pre-configured web router. You can use this router with the company’s VPN service. The Linux and Windows client is great as it has loads of features and other functionalities. The official website gives users lots of technical information. Perfect Privacy official website’s technical information section makes it easy for users to find what they are looking for. The company takes user data protection and anonymity very seriously. The website from an overall perspective is not that user-friendly. Customer support is not as robust as what some of the top VPN service providers have. Strong VPN service providers are hard to come by. But Perfect Privacy VPN service provider is one of them. It has great speed and a very robust Windows and Linux VPN client. The best thing about the client is that it is totally user-focused. We give the company full marks for catering to user anonymity and privacy to its fullest. Perfect Privacy is not the most user-friendly VPN service provider. Because it doesn’t offer a free trial. And it doesn’t have any money-back guarantee. Add to that, it doesn’t have the greatest of customer support department. But they try to make up for it with a good VPN service quality. For a price, that is. If you are willing to pay the price, then Perfect Privacy has some quality features waiting for you. Perfect Privacy is not a bad VPN service provider by any means. It has great speed and a functional Windows VPN client. The company puts the user at the center of its attention. But it tries to undo most of its good work by not offering any free trial. There is no money-back guarantee either. And you don't get to have live chat. Otherwise, Perfect Privacy offers a good quality of VPN service. But for a price.